This year we are proud to celebrate fifty years manufacturing high quality precast concrete products. During that time the Company has continually driven the development of the product and pioneered innovative production methods, many of which have become key to the specification of precast elements within the industry. As a founding member of the UK Cast Stone association (www.ukcsa.co.uk) we have worked to raise awareness of the product and promote its quality and reliability through the development of a ‘UKCSA Specification of Cast Stone’. This specification, along with our in house Quality Management System complying with BS EN ISO 9001:2015, ensures that we remain at the forefront of quality within the industry. We would like to thank our employees, past and present, for their hard work and dedication over the years. Our reputation for quality, reliability and service is testament to the integrity of these individuals, without whom our achievements would not be possible. As we look to the next fifty years, we are committed to preserving, and where possible improving, the standards that we have worked to attain. Through investment in our people, infrastructure and technology we will continue to develop our products and services to ensure they exceed the expectations of the industry. More images of Plean’s capabilities in Reconstructed Stone. 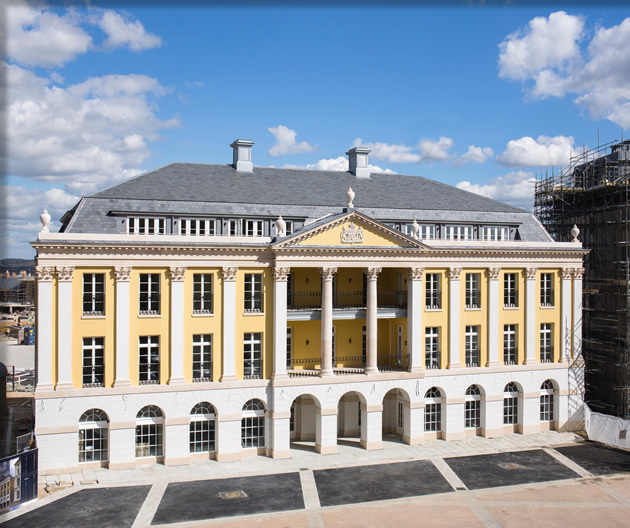 Following rapidly at the heels of the completion of Building 3, Queen Mother Square, Poundbury is the commencement of the reconstructed stone on Building 4. Building 4 comprises the three principal Classical Orders, the photographs show the construction of the Doric Order from ground to first floor. 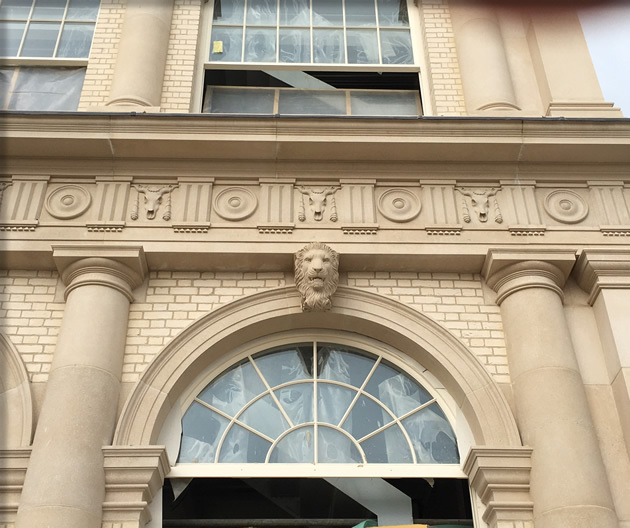 Included in this order are circular and square pilaster column shafts, moulded bases and capitals, ornate frieze course, architrave beams, moulded cornice, archivolts & lions head feature keystones. 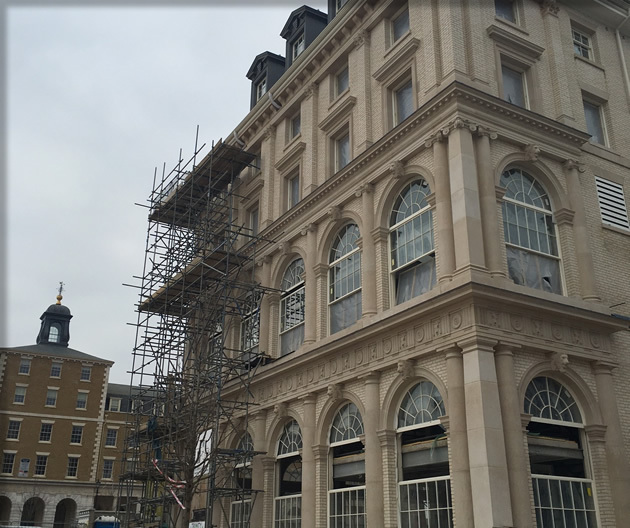 Further to our news item in February of our Classical Stone supply to Poundbury and our promise of more photographs, we are delighted to post images showing the progress of Building 3. In particular the Corinthian Capitals, Entablature & Pediment. There remains only five feature finials still to fix and that will complete the reconstructed stone supply to Building 3. This represents another significant achievement for all the personnel involved within the company and one that we can be proud of. Plean has been producing Reconstructed, Classical Stone for over 25 years. In 1989 we were successful in securing an order to supply to Regents Park, London. 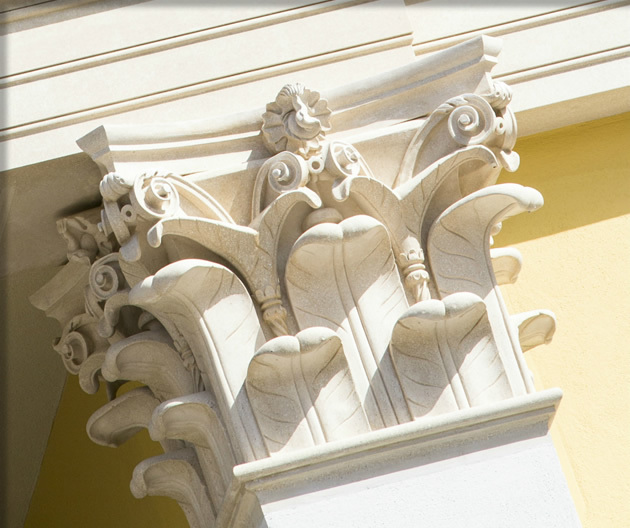 This began a longstanding relationship with Architects, Quinlan & Francis Terry which we are delighted to say is still flourishing with the highly prestigious development of Queen Mother Square in Poundbury, Dorset. 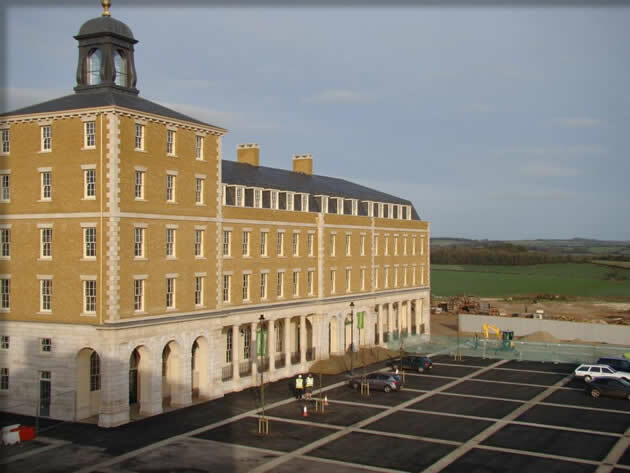 Poundbury is an urban extension of Dorchester, built on Duchy of Cornwall Land according to architectural principles advocated by the Prince of Wales. Its construction began in 1993. The Architecture is unashamedly traditional and reflects the local style. It is currently half way through its development which is due for completion in 2025. 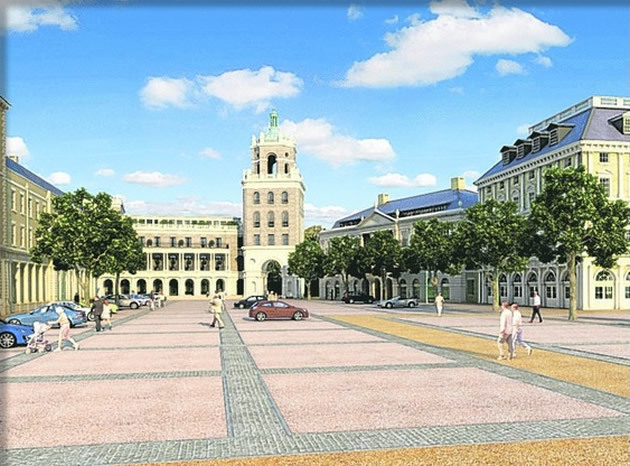 Poundbury is home to over 2000 people, employs over 1600 people and accommodates over 140 businesses. 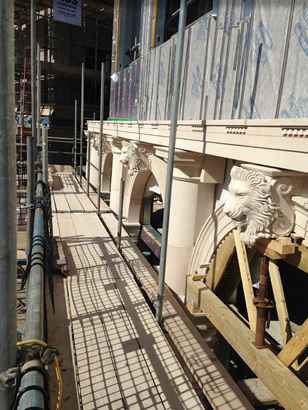 The initial supply to Queen Mother Square began in 2010 when we were awarded the contract for the wet cast, reconstructed stone package for Buildings 5, 6 & 7. In 2014 we undertook the manufacture of Buildings 3 & 4, both highly ornate, classical designs with significant mould & casting demands. Both contracts are currently under construction and we look forward to posting some exciting images in the near future. The photographs show the architects impression of the completed square and elevations of Building 5. Looking at the image of the square, Building 5 is evident on the left and Buildings 3 & 4 on the right. 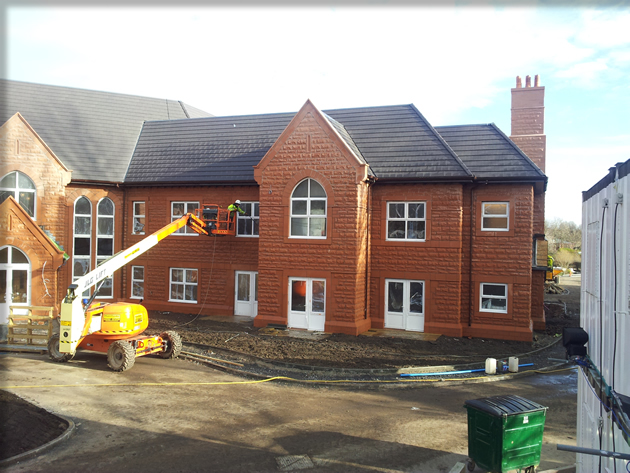 The Graduate Centre & Porters Lodge are two new, classically designed buildings. Incorporating both Doric & Ionic Orders, the stone package includes a large volume of profiled & ornate detail. A significant mould requirement will be necessary to produce the reconstructed stone, involving master model makers & stone carvers to provide the patterns for fiberglass & rubber mould construction. All the material will be made in wet cast, reconstructed limestone, with an acid etched finish. Circular and plain column shafts with entasis, Doric & Ionic Capitals, Structural profiled Architrave Beams, Profiled Cornice and Band Courses with engaged dentils, Ornate Acroterion, sills and heads form the main reconstructed stone elements. Lady Margaret Hall will constitute another significant entry in Plean Precast’s Classcial Stone portfolio and consolidate our position as one of the UK’s leading manufacturers of bespoke architectural precast. First photograph of the redevelopment of Nazareth House in Glasgow. Plean supplied over an 8 month period a large volume of hand made textured ashlar and associated dressings. The project epitomises the benefits of quality cast stone when faced with the challenge of matching an existing natural stone building. The original Nazareth House is built of red sandstone, textured ashlar and smooth faced dressings, band courses, gables etc. Our remit was to supply a product that would be sympathetic to its surroundings in both colour and detail. 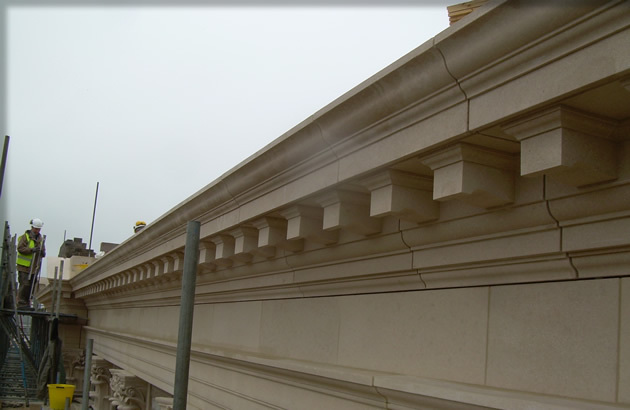 It was of equal importance that the integrity and durability of the cast stone would ensure a high level of consistency and uniformity throughout the project. The architects, Oobe Architects based in Newcastle, specified a white marble based concrete with an acid etched finish. 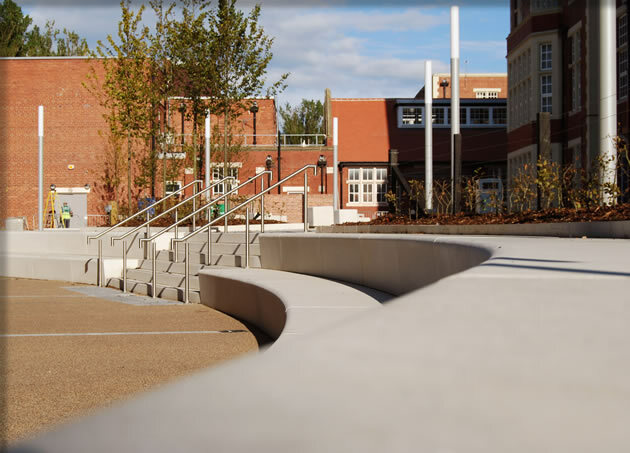 There was a variety of different elements on the project including steps, amphitheatre seating units( both straight and curved), cube seating and kerbing. It was important that the new precast be sympathetic with the new and existing buildings and to contrast with the planting. The mould quality was imperative to ensure a high quality finish and the variety of detail dictated a large number of moulds necessary. The site programme was fairly onerous and production spanned over a twelve week period during the first half of 2014. Bam Construction (Northern) were the main contractors. It is an excellent example of the aesthetic and practical benefits that precast can bring to a landscaping project. 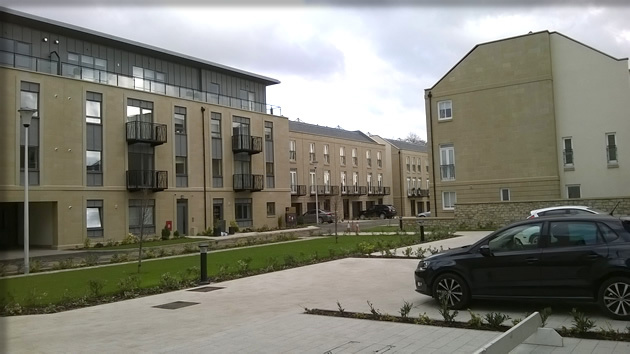 Plean Precast Ltd are delighted to showcase the recently completed Cala Homes development at Trinity Gardens, Edinburgh. This prestigious site is located in one of Edinburgh’s most fashionable areas. Planning stipulated that the development be built of natural stone, however by highlighting some of the larger bespoke developments within our contract portfolio, we were able to confirm our ability to supply large volumes of cast stone ashlar to a very high quality. 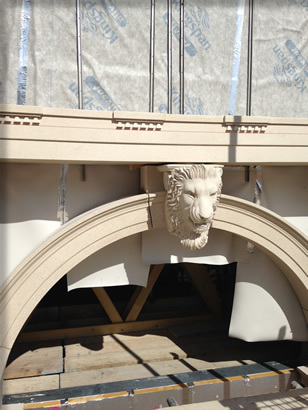 This project offered another opportunity to demonstrate how good dry cast, cast stone can really be. We had to guarantee a highly consistent finish over the three year build period and beyond. The final appearance had to closely resemble natural sandstone, in order to meet these aesthetic expectations the quality control required in all aspects of the cast stone’s manufacture had to be rigorously adhered to. It was imperative that the weathering resistance of the cast stone would attain its optimum level. 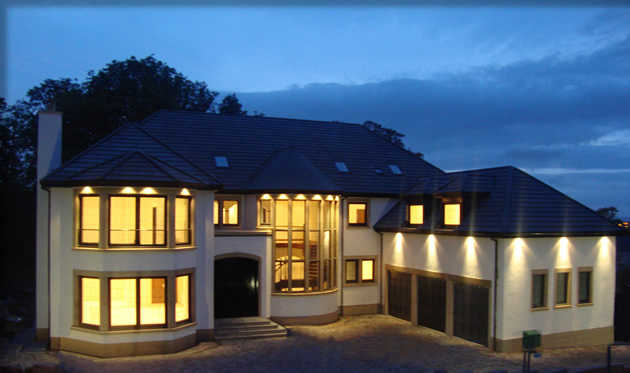 It is important to mention that the build quality throughout the project was of a very high standard. It should not be underestimated the importance of handling & building Cast Stone in the correct manner. 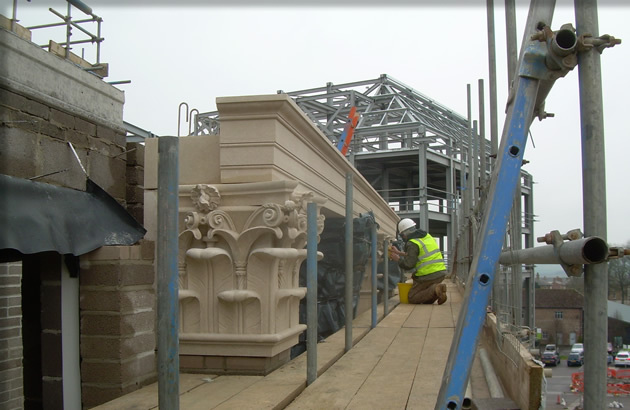 Land Engineering Ltd’s stone masonry team was responsible for the design & build. It was critical that all concerned with the project, not least the end users, had their expectations met. We believe that these goals were fully achieved. It is always of interest to re-visit completed contracts and monitor how our material is performing. It is also very easy to forget such work and treat it as yesterdays news. It was therefore pleasing to see the Antonine Centre in Cumbernauld, standing up to the rigours of our Scottish climate and basking in some glorious winter sunshine. 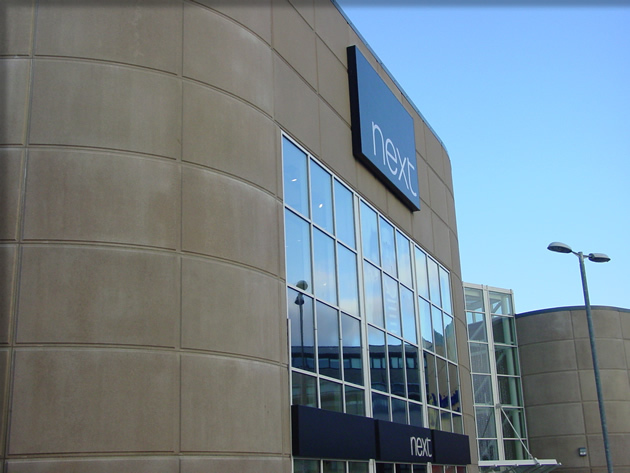 We supplied over 800 reconstituted stone cladding panels during 2006 & 2007, covering over 3000m2. The units were given an acid etched finish to all exposed faces. With such a large project, production spanning over several months, it was important that all aspects of our quality control procedures were strictly adhered to. The photographs below show a highly uniform and consistent finish throughout and indicate a highly durable and weather resistant material. A good advert for Precast Concrete. 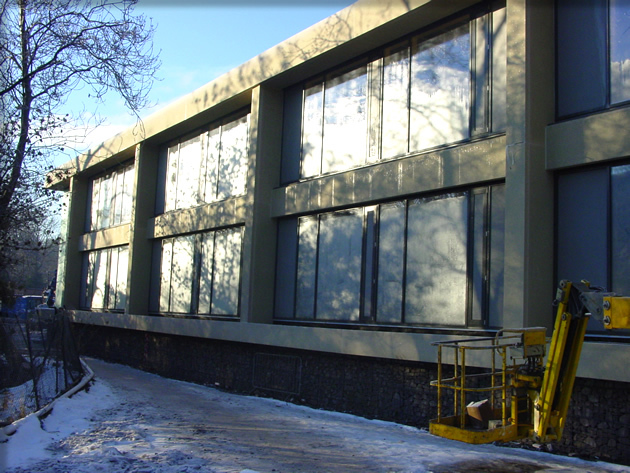 One of our most significant contracts during 2010 has been the supply of wet cast, acid etched panels to Hillhead Primary School in Glasgow. The school was designed by jmarchitects Ltd and constructed by City Building (Glasgow) LLP. The panels were erected by Stone Engineering. Approximately 435 panels were supplied covering a finished area of 1600m2. The elevations have only recently been available for photographs and we are delighted to have the opportunity to show the first images of the school on our website. It is another excellent example of the sustainability of Precast Concrete cladding and one that we are thrilled to be adding to our portfolio. Plean Precast complete the supply of base blocks, sills, mullions and lintels to luxury house builder, Nexus Homes, for their development of 5 houses in Thorntonhall. Copyright © 2015 Plean Precast Ltd.